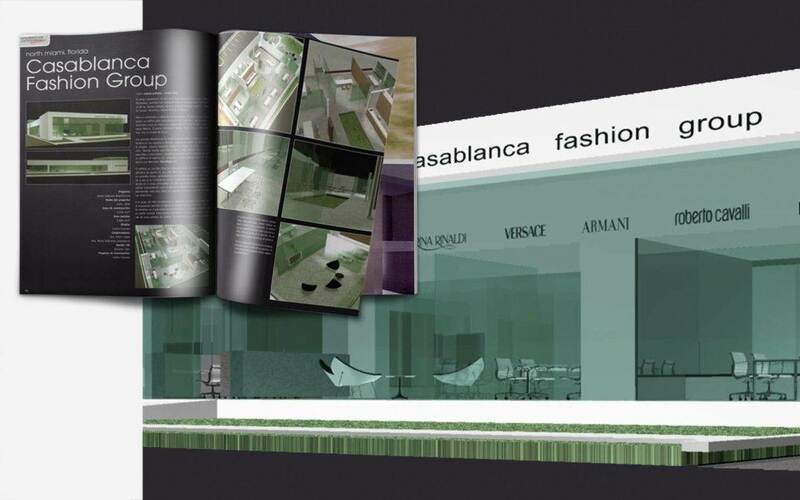 The Casablanca group is not only the best exponent of high fashion in Venezuela, they are also exclusive representatives for Latin America of the brands: Armani, Versace, Dolce & Gabanna, Valentino, Roberto Cavalli, Moschino, Marina Rinaldi and MaxMara. For the exhibition and sale of the collections of these brands they needed a building that withheld the new offices and in addition was a showroom to give appointment to the owners of stores from the south cone up to Mexico. The intermediate chosen point – between Europe and Latin America – was the city of Miami. The great fashion designers have understood the power of Architecture in its spaces and stores, as an indispensable element in the image. Claudio Silvestrini designed the stores for Armani, as well as John Pawson designed for Calvin Klein and Peter Marino does the same for Dior and Louis Vuitton. Casablanca decided to trust the design of the new building to the talented Venezuelan Carlos Guevara, author of Casablanca, Las Mercedes. The building was conceived as a ship that levitates softly on a grass rug. It is a white box that has been sculpted, tearing the great walls, perforating them until achieving great openings, where light is the honor guest to participate of the space. The piece is divided in 4 main zones: A completely crystallized hall with transparent windows that opens in the main façade to give a welcome; this area has a meeting room and two offices for its directors. Throughout the hall we find an element in frosted glass that when trespassing allows entering the showroom of great space. This is divided in six sub-spaces of exhibition, articulated around a central garden. This can be divided in nine work areas, through some wood panels. The rest of the vertical surfaces are great crystal walls, some transparent and some frosted, creating always a continuous visual or translucent space. The third area is a deposit where the runway of all the pieces of the collection will come out. In the second level is where the managerial offices are located. This is a building that shocks for its simplicity, for the proportions and the quality of the spaces. It is a volume that reflects seriousness, design, elegance, and professionalism.